Newspapers and cardboard can be used as part of the mulching process. 2-6 full pages of newspapers should be placed around the circumference of the base of the desired plant. Keep newspaper away from the stem or trunk by about two inches, for acidic reasons. On top of the newspaper or cardboard, apply a layer of mulch. Mulch can be anything from sawdust, wood or bark chips to grass clippings. Shredded paper can also be used to package shipments. Paper products have been estimated to represent 35 - 40% of the waste disposal in landfills. 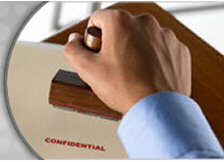 Do you know how long you are required to keep documents before destroying them. We have compiled a document retention schedule for you. Q: Do I need to remove staples? A: No. Staples, Acco fasteners and paper clips do not need to be removed. Q: What laws or regulations protect my personal information? A: Also known as PIPA, the Personal Information Protection Act established on In January 2004, protects any information that private sector organizations have at their disposal. PIPA provides guidelines for the collection, use and disclosure, of this information, and is overseen by the B.C Information and Privacy Commissioner. A: Any organization that fails to protect the privacy of personal information can face legal action, industry or regulatory sanctions, as well as damage to their reputation, brand, and business relationships. It is impossible for businesses not to collect personal information, whether it is employee or customer related. Businesses are held liable for the responsible use and storage of this information, and when no longer needed, its responsible destruction. Q: How much does it cost to have my papers picked up and shredded? A: The cost varies and depends upon volume. We charge by weight or container. Contact us to get a custom quote for services. Q: What if I have a high volume of paper to shred at certain times of the year? A: Many businesses have 'busy times' when more paper is generated, and fiscal year-ends promote yearly purges. Docu-Shred will work on your schedule. Q: What happens to the shredded paper? A: All shredded paper gets recycled into another paper product.